Edited by: Beatrix Heintze. Series edited by: Beatrix Heintze. Livingstone’s and Stanley’s transcontinental explorations in Africa met with tremendous public interest across Europe. In Germany, one of the consequences of this public interest was the founding of the German Society for Exploring Equatorial Africa by the doyen of German Anthropology, Adolf Bastian, in 1873. The society was dedicated to the ‘urgent task of leaving no stretch of our globe untrodden and therefore unknown’. 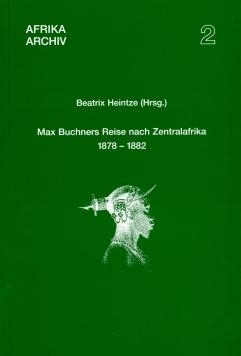 Of all the research expeditions carried out in south-western Africa in the years that followed, Max Buchner’s (1878–1882) is the only one whose course and results were not later circulated in book form. As a result, Buchner’s experiences and observations are only to be found in brief, widely scattered newspaper and magazine articles, which are difficult to access today and can only be tracked down through great expenditure of time and money. Buchner’s expedition to Africa has therefore never received the same attention as other voyages of discovery in his generation. However, as Buchner was among the first visitors to the Lunda kingdom and spent six months there, his reports contain a wide variety of observations which are of considerable significance as historical source material, especially since there are few eye-witness reports of central Africa from this period. In addition, Buchner’s reports shed light on the general conditions under which these early expeditions were carried out, and provide evidence of both the general and anthropological attitudes of Europeans towards Africans at that time. Max Buchner’s letters, reports and studies concerning his journey to Lunda are collected and republished in this volume, which also includes a detailed introduction and a biographical sketch. Now that it is accessible, this material should receive the attention from scholars that it deserves. Max Buchner (1846–1921) was Deputy Reichs Commissioner in Cameroon from 1884 to 1885 and Director of the Museum of Anthropology in Munich from 1887 to 1907.